The ’70s were great for all sorts of reasons, and not just disco. Post-it notes. An MRI. The floppy disc. All those came our way that decade. 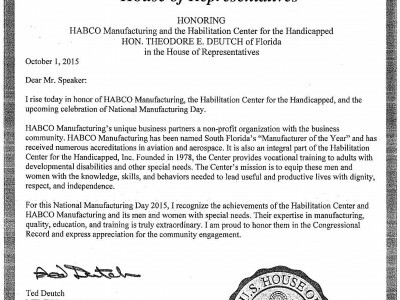 And so did the Habilitation Center in Boca Raton, perhaps the most heartwarming creation of all. And so, since 1978, the Habilitation Center campus has grown in both staff and campus size, now providing vocational training and daytime programs for 225 disabled adults living with emotional and physical disabilities ranging from autism and Down syndrome to cerebral palsy and other conditions. The center employs 50 people, including specialists in mental health, engineering, marketing and horticulture. The center bought 11 acres back in 1980 and built the sprawling suburban complex that now helps to train clients for possible outside employment, Ferris explains. It also provides them a venue in which to become productive contributing members of society. A Monday through Friday non-residential facility, the Habilitation Center has two main vocational programs. The oldest is the manufacturing center, where clients and staff–including at least one full-time engineer–work with companies like Motorola and Tyco to make sophisticated mechanical parts. The Habilitation Center’s other business enterprise is its seven-acre nursery, which provides bedding plants and flowers to some of South Florida’s most brightly landscaped landmarks. “We’re probably a very well-kept secret,” says Ferris, about the nursery business that sells annuals and perennials to venues in 33 cities including Mar-a-Lago and The Breakers in Palm Beach, as well as Boca West Country Club in Boca Raton. The center operates on an annual $4 million budget, which comes from Florida’s share of the Medicaid Waiver program, the state’s Department of Education, its own manufacturing and nursery sales, and donations, Ferris says. “More than 20,000 Floridians with with developmental disabilities are sitting at home today twiddling their thumbs because they have nothing to do,” says Ferris, who explains the center always wants to increase its client list, but has limited resources. The Habilitation Center is located at Center 22313 Boca Rio Road in Boca Raton. For more information, call 561-483-4200 or visit habcenter.com.